Tablelands boy Joey Donald is proving to be a fighter. The eight-year-old has been in a serious condition at Townsville Hospital since November 18, after falling off a horse and being dragged a distance. ATHERTON Tablelands boy Joey Donald is a fighter. 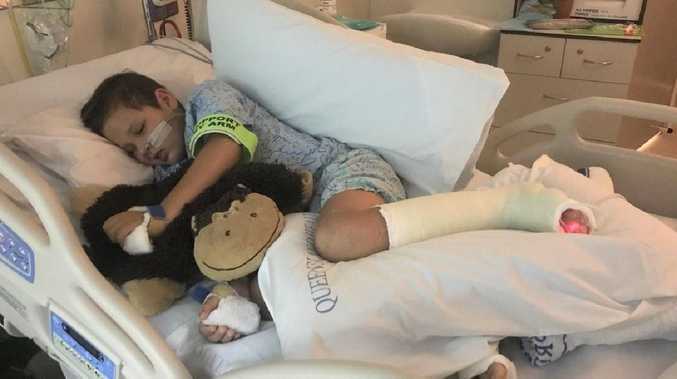 The eight-year-old was dragged by a horse when his foot got stuck in a stirrup after a fall at a Lake Eacham property on November 18. The little boy was rushed to Atherton Hospital with a range of serious injuries before being flown by helicopter to Townsville Hospital. 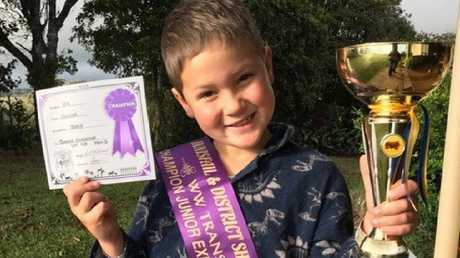 Eight-year-old Tablelands boy Joey Donald is fighting to make a recovery in Townsville Hospital after falling from a horse on November 18. Joey spent several weeks in the Paediatric Intensive Care Unit before recently being moved into the paediatric ward. As well as suffering multiple skull fractures, a broken nose, collapsed lungs, a broken elbow, a ruptured liver and third degree abrasions on his back, Joey has been diagnosed with severe brain damage, called Diffuse Axonal Injury. His mother Sarah Mohammed said while there had been slow progress in Joey's recovery, he had also jumped some massive hurdles. 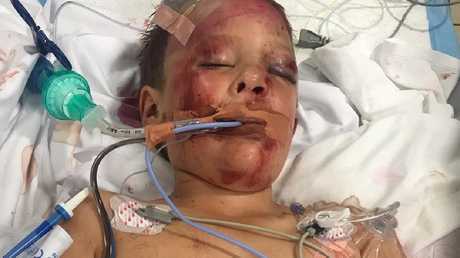 Tablelands boy Joey Donald, 8, is fighting to make a recovery in Townsville Hospital after a terrible horse riding accident. Pictured it Joey after winning ‘Champion Junior Cattle Exhibitor’ at the Innisfail Show. He he donated his prize money to the ‘Drought Angels’. "Joey's move to the Paediatric ward has gone well, we have the most amazing physio Donna working with him (Monday to Friday) to help clear his chest," she said. "She has cast his feet to maintain range in tendons, ligaments and what is left of his poor little calf muscles. "We have a long journey ahead of us but with the help of the amazing staff at Townsville Hospital, world wide prayers from all denominations, love and support of our family, friends, amazing rural communities, and complete strangers it makes the road a little less scary." Joey is expected to be transferred to Brisbane next month for further medical treatment and rehabilitation.